The forward under-seat locker in the saloon of the Jeanneau Sun Odyssey 34.2 is of a fairly generous size, but its use is somewhat restricted due to the possibility of damaging the exposed log and depth transducer units that protrude above the level of the locker sole. 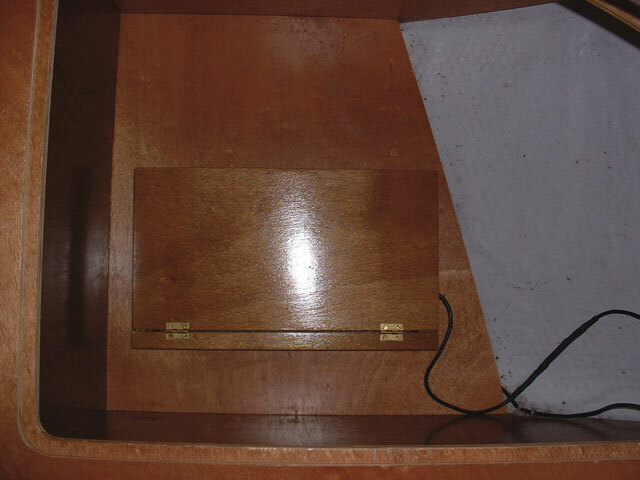 To offer some protection, I decided to make a hinged cover which would prevent them being knocked by items being placed in or removed from the locker, but would still allow easy access to the transducer as required. I first cut four pieces of ply to size for the sides, followed by four pieces of beading for corner supports. To allow for the transducer cables I made a small cutout in one of the sides, and glued the parts together to form an open box. Next I cut the lid and hinge strip to size and glued the hinge strip in place. To protect the plywood I rubbed it all down and applied three coats of varnish. I then fitted the hinges and lid and screwed the unit to the locker sole. The total cost was £1.50 for the brass hinges and screws. The beading and plywood came from my scrap box, so cost nothing.